Discussion in 'questions. answers. conversations.' started by Mikewarren1000, Apr 12, 2019. Hi, anyone know the process of getting from the regular United gates to International.? I didnt realize it was separate. I guess I just assumed it was like LAX where the flights to Europe/Asia are leaving from Terminal 7 just like the domestic flights. And the Polaris lounge is right there also. Looks like in SFO the flightts to overseas leave from the International terminal. Are you connecting to a United international flight? 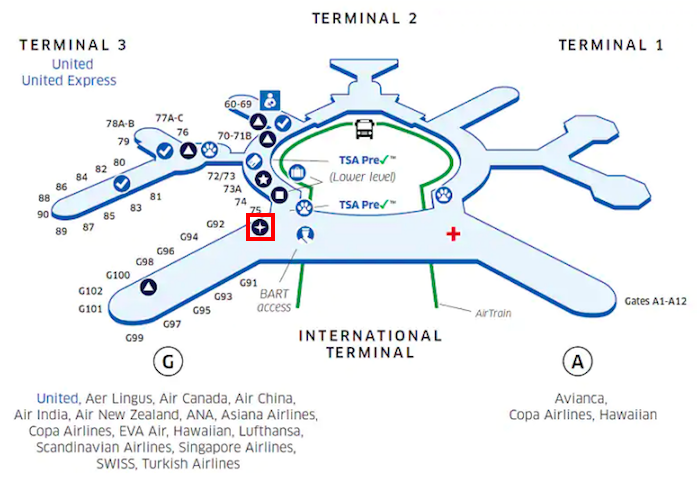 At SFO, United uses T3 and International G, which are connected airside, so you wont have to reclear security. If you have to connect to an international flight departing from International A, you will have to exit and re-clear security. The A and G concourses of the international terminal are not connected airside. If you're flying Business Class with UA, you'll have access to their Polaris Lounge at SFO. If you have an Amex Platinum card, the Amex Centurion lounge is also in T3, as well as two restaurants that are in the Priority Pass network. Roughly how far of a walk is it from the United gates in T3 to the Polaris lounge? UA's SFO Polaris Lounge is right by the T3 & I-G terminal connector.